Here is my report from Saturday's action at the house of David Jones, who sits on the Tyson Foods Board of Directors. The photos were taken by a UFCW organizer. About 50 people, including 20 striking Tyson workers, went inside a gated community in Middleton on Saturday to picket outside the house of David Jones, who sits on the Tyson Foods Board of Directors. The action was jointly organized by the UFCW Local 538, the Student Labor Action Coalition, and the South Central Federation of Labor, with significant participation also from the International Socialist Organization. I had not gotten to Middleton when the main group entered the gates, but I heard that when the picketers got to Jones' house, he immediately drove away in a black Mercedes. (Too bad no one got a picture of that.) Nevertheless, we proceeded to picket outside his house for around half an hour, proclaiming Jones the Grinch and singing pro-worker Christmas carols. It was a fun action, with everyone in good spirits. The gated community rent-a-cop came after 20 minutes or so and asked us all to leave. But he let us stay until the TV reporter came and got some good coverage. As we were leaving, I tried to go put a piece of coal (actually charcoal) on Jones' doorstep, but the cop wouldn't let me; I managed to leave it on his drive way. These are the types of action we need to be doing more of to help the workers win the strike. Email me if you'd like to be contacted for future creative actions, at Jones' house or wherever. 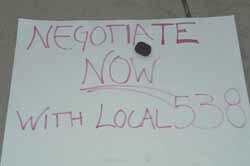 Tyson has just yesterday asked the union to come back to the negotiating table. While I'd like to this is because of pressure from the workers and community (including this action and the recent UW Regents' decision to divest $200,000 in Tyson stock), after 10 months on strike, I am not optimistic that the company will offer much more than their original, pathetic proposed contract. Hopefully I'm wrong. Either way, we need to continue supporting the workers, including this Saturday at the 1:30 pm rally in Jefferson. 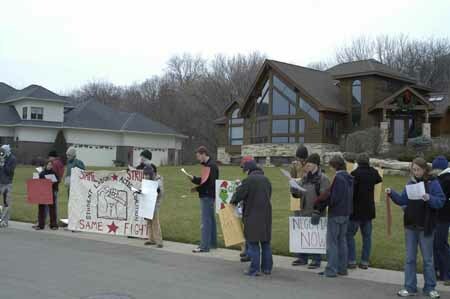 1) A Tyson worker leads the picket and labor-themed carols outside of Jones' house. 2) UW students, mainly SLAC and ISO members, sing "Rudolph the Union Reindeer" in front of Jones' house (the brown one). 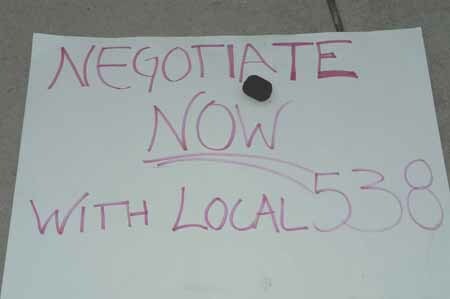 3) The lump of (char)coal I left in Jones' driveway, placed atop a sign stating one of the action's demands, which appears to have been met. 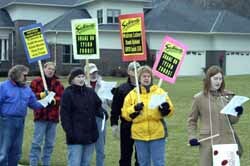 4) WISC-TV (the CBS affiliate) interviews a striking Tyson worker. Wisconsin Public Radio was also present. 5) SCFL represents! Union members and other Madison community activists join the picket. 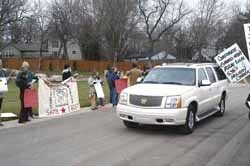 6) Ralliers let a fancy-shmancy SUV pass through. Although other members of the gated community that drove by honked and offered verbal support for the picket, this SUV driver did not.